Stefan Jackiw is one of America’s foremost violinists, captivating audiences with playing that combines poetry and purity with an impeccable technique. Hailed for playing of “uncommon musical substance” that is “striking for its intelligence and sensitivity” (Boston Globe), Jackiw has appeared as soloist with the Boston, Chicago, Cleveland, New York, Philadelphia, and San Francisco symphony orchestras, among others. This season, highlights include performances of the Mendelssohn Concerto with the Dallas Symphony, under Juraj Valčuha, and the Minnesota Orchestra, under Ilyich Rivas. He also returns to the Utah, Omaha, and Kansas City Symphonies, and in Europe, tours with the Antwerp Symphony Orchestra, and performs with the Residentie Orkest, Copenhagen Philharmonic, and the Helsinki Philharmonic. Further afield, he appears with the Singapore Symphony and Tasmanian Symphony and returns to Korea to perform with the KBS Symphony Orchestra. In recital, Jackiw performs the complete Ives Violin Sonatas with Jeremy Denk at the Tanglewood Festival, ahead of their upcoming recording of the works for Nonesuch Records. He also joins the acclaimed pianist alongside Benjamin Beilman, and Pamela Frank, in performances of the Mozart Violin Sonatas both at Carnegie Hall and Philadelphia Chamber Music Society. Jackiw will also appear in recital with Conrad Tao playing works by Stravinsky, Lutoslawski, Saariaho, and Brahms. Last season, following their performance of Korngold with the Cleveland Orchestra, Jackiw reunited with Valčuha for performances with the Detroit Symphony and Luxembourg Philharmonic. He also made his debut with the National Symphony in Washington, DC, performing Bruch’s Violin Concerto with Marek Janowski. In recital, he appeared on tour throughout the US, with performances in Baltimore, Houston, Philadelphia, and with the Boston Celebrity Series. Abroad, Stefan appeared on tour performing the Tchaikovsky Concerto with l’Orchestre National d’Île-de-France in Europe and Asia, which included his debut at the Philharmonie de Paris. He also returned to the Bournemouth Symphony playing Korngold with Andrew Litton, and Amsterdam’s Concertgebouw, performing Tchaikovsky with Residentie Orkest. Highlights of recent seasons include a performance of Prokofiev’s Second Violin Concerto at Carnegie Hall with Mikhail Pletnev, as part of a multi-city tour with the Russian National Orchestra; as well as performances with the St. Louis Symphony under Nicholas McGegan, the Rotterdam Philharmonic under Yannick Nézet-Séguin, the Indianapolis Symphony under Krzysztof Urbanski, and the Pittsburgh Symphony under Valčuha. Other highlights in Europe included his performances Netherland Radio Symphony and Ludovic Morlot at the Concertgebouw. In Asia, Stefan recently appeared for the first time with the Tokyo Symphony at Suntory Hall under the direction of Krzysztof Urbanski, and returned to the Seoul Philharmonic under Venzago. He also toured Korea, playing chamber music with Gidon Kremer and Kremerata Baltica. In Australia, Stefan toured with the Australian Chamber Orchestra play-directing Mendelssohn. He also gave the world premiere of American composer David Fulmer’s Violin Concerto No 2 “Jubilant Arcs”, written for him and commissioned by the Heidelberg Festival with the Deutsche Kammerphilharmonie under Matthias Pintscher. Recitals included his performance of the complete Brahms violin sonatas at the Aspen Festival, which he has recorded for Sony. He also recorded the Beethoven Triple with Inon Barnatan, Alisa Weilerstein, Alan Gilbert and Academy St. Martin in the Fields. Jackiw is also an active recitalist and chamber musician. He has performed in numerous important festivals and concert series, including the Aspen Music Festival, Ravinia Festival, and Caramoor International Music Festival, the Celebrity Series of Boston, New York’s Mostly Mozart Festival, the Metropolitan Museum of Art, the Washington Performing Arts Society and the Louvre Recital Series in Paris. As a chamber musician, Jackiw has collaborated with such artists as Jeremy Denk, Steven Isserlis, Yo-Yo Ma, and Gil Shaham, and forms a trio with Jay Campbell and Conrad Tao. At the opening night of Carnegie Hall’s Zankel Hall in New York, Jackiw was the only young artist invited to perform, playing alongside such artists as Emanuel Ax, Renée Fleming, Evgeny Kissin, and James Levine. 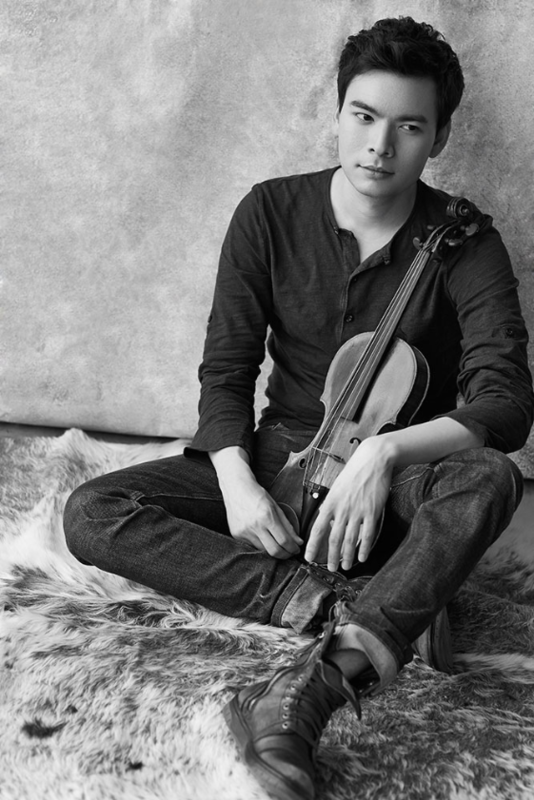 Born to physicist parents of Korean and German descent, Stefan Jackiw began playing the violin at the age of four. His teachers have included Zinaida Gilels, Michèle Auclair, and Donald Weilerstein. He holds a Bachelor of Arts from Harvard University, as well as an Artist Diploma from the New England Conservatory, and is the recipient of a prestigious Avery Fisher Career Grant. He lives in New York City.